Looking for a fundraiser for students? We’ve got one for you. 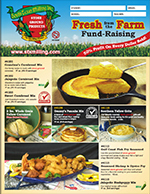 Let us share with you just why Fresh from the Farm fundraising is perfect for your organization. First off, you can trust our products enough to put your name behind them. That’s because they’re not just good; they’re also good for you. Each product is carefully made with pure, high-quality ingredients that have passed a wide range of taste tests with flying colors, and you don’t even have to refrigerate them! They can be saved for special occasions throughout the year. Secondly, we offer a variety of items for a variety of budgets. From our famous cornbread mix and bold seasonings to ready-made dinner mixes; we’ve got your craving covered. Finally, our profit programs are second to none. We offer two distinct plans— one giving your organization fifty percent (50%) of the profit and one offering thirty percent (35%). No upfront costs, no shipping charges, and most importantly— no gimmick of any kind! If you’d like more information on how we can help make your upcoming fundraiser a success, contact us. We’d be happy to send you brochures and order forms, free of charge. We look forward to partnering with you!